TOFU MOM . . . and gravy! : Isa's "Punk Rock Chick Pea Gravy"
Isa's "Punk Rock Chick Pea Gravy"
If you're collecting fabulous gravy recipes, (and you are, right? 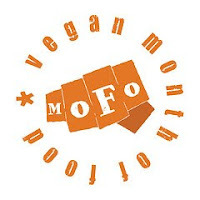 Vegan Month Of Gravy isn't going to be around much longer!) this is one recipe that absolutely-freakin'-everyone needs to have. And make. Often. Like, now. This is the gravy that beats all gravies, hands down. It's another of my "recipes from someone else's cookbooks", another favorite I've used for years - invented by the queen of vegan recipes, the fabulously talented Isa Chandra Moskowitcz. And what, you may ask, is this fabulously tasty, wonderful gravy-of-amazingness? Punk Rock Chick Pea Gravy. From the equally wonderful cookbook, Vegan With A Vengance. The stuff of legends. Gravy of the gods. A meal in a pan. If you haven't heard of it by now, you're missing out. I promise I'm not exaggerating, or making this stuff up. OK, so, I admit *blush* it took me a year or so, after buying the cookbook to attempt this, back in my gravy-ignorant days. It's not something you whip up in thirty seconds, and doesn't have a short ingredient list, but that doesn't matter. The recipe is easy and the stuff is amazing. You WILL love it, I promise. I am addicted to the stuff, seriously. She probably didn't know I have the world's crappiest camera and a poorly-lit kitchen in which to photograph said gravy, causing it to look FAR less appetizing than it actually is. Rest assured it's much prettier than this! OK, seriously, enough raving about the gravy; As I've said many times, I don't use a lot of "other people's" recipes, but I see no sense in trying to improve on something that is THIS good. Really, really good!! 1. Mix the flour with 2 cups of water until the flour is mostly dissolved. Set aside. 3. 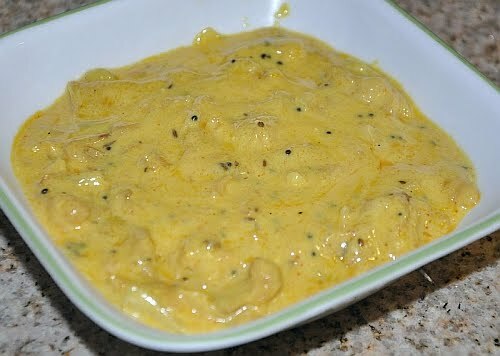 Add the olive oil, onions and mustard seeds; cook for 10 minutes, stirring occasionally until the onions are browned and the mustard seeds are toasted. 4. Add the garlic and saute for 2 minutes more. 6. Add the herbs and spices, soy sauce, and lemon juice. 7. Scrape the bottom of the pan to loosen any browned bits of onion. 8. Lower heat and pour the flour mixture into the pan. 9. Stir constantly until a thick gravy forms. 10. Stir in the nutritional yeast. 12. It may look like it doesn't want any more water added to it, but just keep mixing with a wire whisk, and it will loosen up. Keep warm until ready to serve. 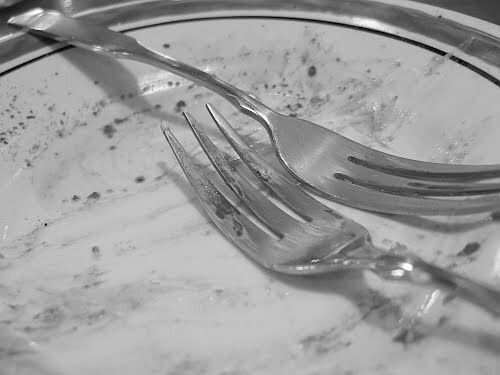 Sadly, your plate will look like this when you're finished. And you'll wish you'd made a double batch. This is a classic VWAV recipe I haven't tried yet but I really should, yum! I don't think I have ever made this, even thought people talk about it all the time! Thanks for posting the recipe, I'll have to check it out. I haven't made this yet either. What, am I crazy? It looks divine. I love this gravy as well, but oh! the energy involved in making it...I'm exhausted just thinking about it. So I just do the .99 Road's End Organic Packet of Gravy. But I guess that wouldn't be the most exciting blog post. Interesting, I never thought it required any more energy than any other gravy. I have never tried an "instant" gravy but I just cannot imagine they would be anything close to the same... Maybe I'll taste test some!! That would make a GREAT blog post, I think you're on to something!! There ya go! You could have a mashed potato bar with different gravies! FYI, the little box of Imagine Wild Mushroom Gravy I had last night was just so so. No where near as good as the Road's End packet.